As the Morts of Lancashire accumulated wealth, they also increased their property portfolios of grand halls and houses. This included Alder House. Alder House near the town of Atherton was built in 1697 by Ralph Astley and his wife Ann. It is believed that Ralph Astley was a local iron merchant who supplied the nail makers of Chowbent with the raw material before taking it back as finished work. The centre of Atherton was locally refered to as Chowbent in times past and even today Chowbent Chapel remains standing. Built in 1722 it is a striking landmark in the town. According to traditional stories, Ralph and his wife met with a tragic end when they were struck by lightning at the same time and are said to be buried in the chapel yard close by. In 1724 Alder House was purchased in joint ownership between Roger Rigby and Adam Mort. There are two possible Adam Mort’s who could have purchased this property. However as he is described as ‘Adam Mort of Astley Manor’ it is more likely that is was the first Adam as mentioned below. The second option would have been more likely to have been refered to as Adam Mort of Peel House. To confuse matters even more, Mary Mort is recorded to have been born in Alderfold Chowbent in 1724 (same year Adam Mort purchased the house). Her parents are shown to be Adam Mort and Martha Leigh. This is contrary to other records that show Martha Leigh as the wife of Nathan Mort. I do not know what became of Mary Mort other than she married Thomas Earle. An interesting twist and maybe in favour of the 2nd Adam being the owner? 1)	Adam Mort re the younger brother of Thomas Mort who inherited the position of ‘Lord of the Manor of Astley’ after his father Adam died in 1659. The other brothers being Robert and Alexander. Adam Mort’s Grandparents were Thomas Mort of Hulton and Margaret Smith and his Great Grandfather was the original Adam Mort of Dam House. 2)	Adam Mort son of Thomas Mort of Peel House in Little Hulton. His Grandparents were also Thomas Mort of Hulton and Margaret Smith and his Great Grandfather was also the original Adam Mort of Dam House. What is of interest, is that Roger died in 1724 which according to the records is the same year he purchased the house with Adam Mort. It is probable that Rogers children continued to live in the house under the care of his friend Adam - who ( if he was the 1st option – Adam of Dam House) was a childless bachelor having never been married. If Roger knew he was dying, this may have even been a charitable arrangement to ensure the care of his family following his death. It would seem that the Mort’s of Atherton (Chowbent) were a caring and well respected family and such a deed towards a friend would not have been out of character. The house was later owned by Thomas Lee who was a wealthy mill owner in the 19th century. He built buttresses on the front of Alder House which still exist today. "My husband and I are both from the Atherton area and we used to play around Alder House when we were kids. The house has always been part of my life. "My husband loves the history of the place -- there are supposed to be tunnels that run underneath the house to the chapel. Peter has been looking for the tunnels but he hasn't been able to find them. We were considering contacting Time Team to see if they could find these tunnels. "We didn't need to do much work to Alder House when we moved in, but we've made the home our own." 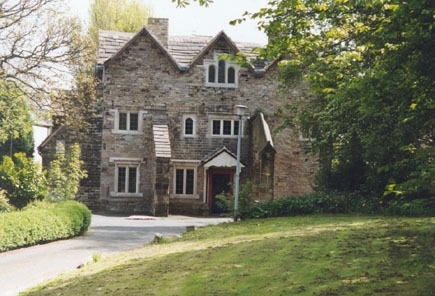 Once used as a health clinic, Alder House is now a private residence off the High Street. Today it is has been returned to its former purpose as a lovely family home and remains a charming gothic looking stone dwelling. Several Morts are buried at Chowbent Chapel, and here is a worthy inscription to the last Mort buried within its grounds. Worth a read! The Memory of the Just shall be blessed. are devoted to Theology by profession. This is the end of the memorial. I have rarely read an inscription that has so praised a man and it is pleasing to know that our Mort ancestors were so highly regarded and respected within this area of Lancashire known as Chowbent.